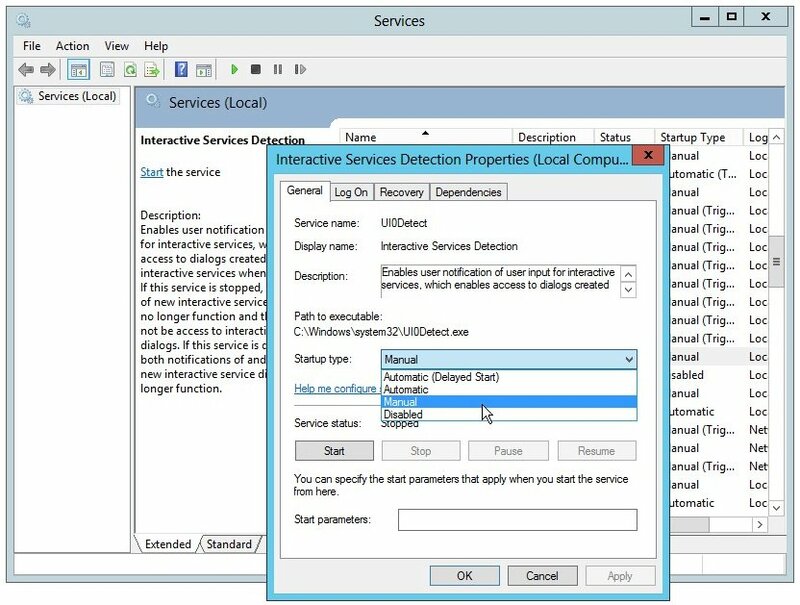 See your Windows Services on the isolated Session 0 with a click of your mouse, while avoiding the Interactive Services Detection Dialog! 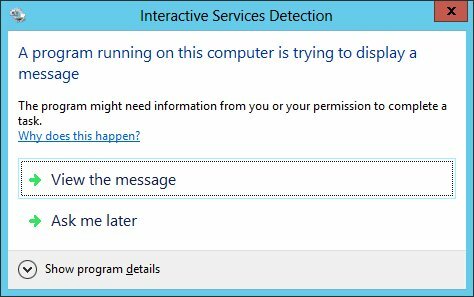 Do you have a Windows Service that shows a window or prompt in Session 0? Microsoft's Interactive Services Detection Dialog usually pops up to take you to see your GUI, but suppose it doesn't? Or worse, suppose it comes up all the time, constantly winking at you from the taskbar? Our free Switch To Session 0 utility is here to help. 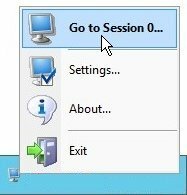 It runs from a convenient tray icon and lets you go to Session 0 whenever you like. Just double-click the icon and you are there - easy! 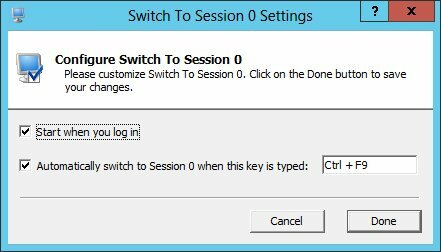 Unfortunately Switch To Session 0 will not work if your computer is running the latest versions of Windows. This is because Microsoft has crippled the Interactive Services Detection service and removed access to Session 0 — by any method. Read more in our blog article describing the changes to Session 0. Note: Microsoft has NOT updated its earlier operating systems. The Switch To Session 0 utility continues to work well with Windows 8.1, 8, 7, Vista and Server 2016, 2012 and 2008. Download and save this free, standalone utility (SwitchToSession0.exe) to a new folder, preferably C:\Program Files\SwitchToSession0\. Double-click on the tray icon ( ) to access session 0. You can also right-click and select Got to Session 0... to do the same. From there, you can choose to start this utility when you log on, or specify a "hot-key" - a combination of keys that when pressed will switch to Session 0 (without having to click the tray icon). The ISDD is controlled by the Interactive Services Detection Service (ISDS), an important background task that enables access to Session 0. The ISDD only comes up when the service is running, so the key to avoiding the dialog is to prevent the service from running all the time. Note that the Switch To Session 0 utility will work with the ISDS intelligently. A request to switch to Session 0 will start the ISDS but it will be stopped soon after you return from Session 0.